How does your personality affect your earning power? Posted on July 15th, by Dr Rob Yeung . How would you like to earn around 10 per cent more every year – for the rest of your life? A recent study led by Tilburg University researcher Jaap Denissen found that people’s personalities had a significant relationship with their earning potential. But the researchers did not find that certain personalities were better all of the time. No, they found that people earned more when their personalities matched the needs of their jobs. For example, think about the personality trait of extraversion. On a scale of 1 to 7 (where 1 is “very low” and 7 is “very high”), how much extraversion do you think a bookkeeper should have in order to do their job well? How much extraversion do you think a teacher should have? And what about a sales person? Professor Denissen and his colleagues asked two experts exactly these sorts of questions. The two experts rated hundreds of jobs on five personality characteristics: extraversion, openness to experience, agreeableness, conscientiousness and neuroticism. The research team then got 8,458 people out in the real world to complete personality questionnaires. These people rated themselves on statements such as “I see myself as someone who worries a lot” (which is a measure of neuroticism, the tendency towards anxious thoughts and feelings). Next, the researchers calculated how congruent people’s personalities were with their jobs, to derive a measure of personality-job fit. For example, the experts may have rated a job as requiring a score of say a 5 out of 7 on the trait of openness to experience. But a person who scored a 3 would have had too little of this trait; a person who scored a 7 would have had too much of the trait. Finally, the researchers gathered salary information for all of the people in their sample and computed the relationship with personality-job fit. The results showed that having a personality that fits the ideal profile made a real difference. The average (mean) yearly salary earned by people in this study was €39,060 (around £34,540). But those who had personalities that fit their jobs tended to earn as much as €3,935 (around £3,480) more every year. It makes total sense that the more your personality fits, the more you may earn. For example, imagine that a job – such as being a skills trainer – requires someone to be running training workshops for around 30 hours a week. That job should suit people who are highly extraverted. So even people who are only moderately extraverted may find the work emotionally draining; they may be less successful at it. 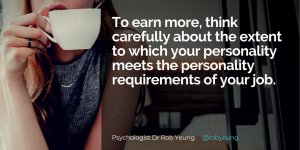 If you want to earn more, think carefully about the extent to which your own personality fits the personality requirements of your work. If you want to improve your personality-job fit, think about the different facets of your own personality. Jaap Denissen’s team found that three personality traits were especially linked to higher earnings: extraversion, agreeableness, and openness to experience. In terms of extraversion, work out how extraverted you are on a scale of 1 to 7. For example, if you see yourself as reserved, you will be lower on extraversion; if you see yourself as outgoing and talkative, you will be higher on extraversion. If you’re not sure, ask friends and colleagues for their opinions. Figure out your level of agreeableness, which is the extent to which you seek harmony in your relationships. If you like to be very honest and speak your mind, you may be lower on agreeableness. If you are a forgiving person who finds it difficult to say no, you may be higher on agreeableness. Decide the degree to which you possess openness to experience, which is your need for different forms of stimulation. If you like to be an expert on a small number of topics, you may be lower on openness to experience. If you are a bit flighty and like to dip into many different topics as well as forms of art and entertainment, then you may be higher on openness to experience. Finally, work out the extent to which these three main personality traits fit the requirements of your job. Are you more or less extraverted than your job requires of you? Repeat the thought exercise for agreeableness and openness to experience. If you’re not sure how much of these traits your job requires, then ask colleagues. Also think about the personality requirements of different jobs in the future. When you consider a promotion or any new job, ask yourself: do I have the kind of personality that would help me to succeed in this job – or does the job require a slightly different personality than what I have? 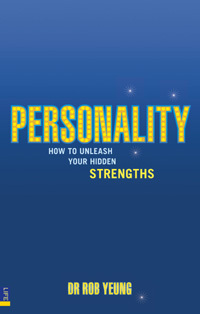 If you want more insight into your own personality – along with plenty of other advice on helping yourself to be more authentic at work and succeed – do consider picking up a copy of my book, Personality: How to unleash your hidden strengths. Why should you be wary about NLP? Want to understand the secrets of success?